Quilt National artists are intrigued by the challenge of expanding the boundaries of traditional quiltmaking by utilizing the newest materials and technologies. The innovative works generate strong emotional responses in the viewer while at the same time fulfilling the creative need of the artist to make an individual statement. These artists are unparalleled in their vision and mastery of their medium. They are folks who toil over thread, fabric, dyebaths, ironing boards and needles to create art that is infused with personal stories, strong narratives and bold visions. This site celebrates their achievements and introduces a wider audience to their art. Take a moment to delve deeper into their stories, link to their websites and appreciate their art. They are an international group that move the legacy of quilting into new territory. 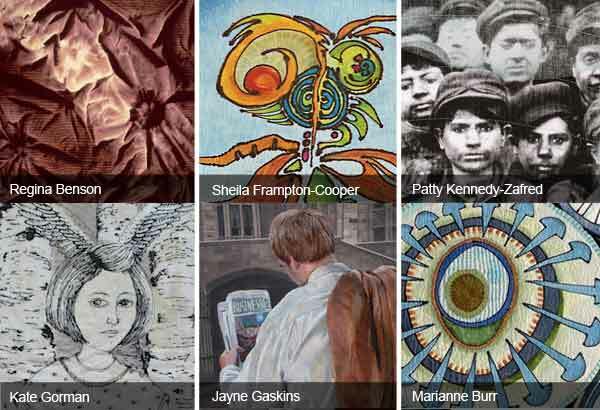 Quilt National is a premier venue for contemporary art quilts. Founded in 1979 by Nancy Crow, Françoise Barnes and Virginia Randles, this biennial international juried exhibition of contemporary innovative quilts is often called the Academy Awards of Quilting. Quilt National demonstrates the transformations taking place in the world of quilting. This internationally recognized exhibition gives quilt artists across the world the opportunity to show innovative work using historically revered traditions. These artists prove that a traditional art form continues to evolve.